Whilst to many, LEGO bricks are ‘just a toy’, to an ever growing army of fans they provide a challenging and enjoyable modelling medium. These fans, calling themselves ‘AFOLs’, or Adult Fans of LEGO, have taken it upon themselves to recreate local landmarks using just the bricks which you may find at a local store. LEGO models created by adult fans though, don’t resemble those you may have created as a child! Masters of their medium these fabulously detailed models may contain thousands of pieces - or perhaps just a handful. Either way, the talented artists have an intimate knowledge of every piece and colour available. Skilfully choosing the ideal piece to recreate a well known landmark. Sometimes creating a model indistinguishable from the real thing, or purely evoking the spirit of a building in just a few small pieces. In fact, landmarks and cityscapes have long been a source of inspiration for LEGO builders. 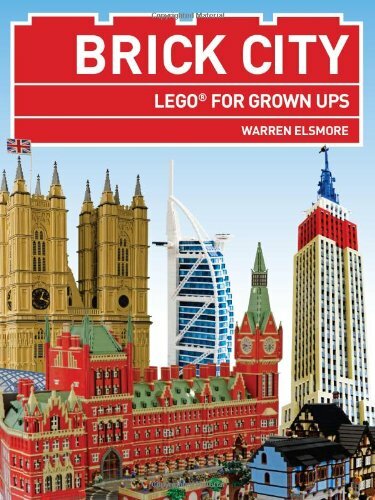 In this book, LEGO artist Warren Elsmore takes us on a world tour and explores different cities and their iconic structures. Cities are examined and re-created in LEGO form. Comprising amazing artwork, exploratory photographs and detailed breakdowns, Brick City looks at the essence of what makes an urban landscape recognisable. Click here for a parts list of the models.